Knowing how to organize your closet will allow you to store more stuff with less hassle, no matter the size of your closet. Closets are among the most coveted features for home buyers. It seems we’re all looking for more space to store stuff. By utilizing the space available in your closet (be it large or small), you can maximize its storage potential. Consider removing sliding closet doors and replacing them with bi-fold doors in order to gain better access to the center of the closet. Install a second rod midway between the upper rod and the floor to increase hanging space. Make sure hanging rods are at least 36 inches apart. If you have a swinging door on your closet, utilize the back of the door for storage. Hang a shoe bag on the back of the door for storing not only shoes but also socks or tights, underwear, belts, scarves and other accessories. Another option is to install hooks on the back of the door for hanging bags, hats, a bathrobe, or the next day’s wardrobe. Use the space at the bottom of the closet for storage. Slide in a shoe rack, small dresser or storage shelves to fill the empty space or stack clear plastic bins for storing out-of-season clothing. Most closet have a couple of feet between the existing closet shelf and the ceiling. Add a shelf midway between the two and double your shelf storage. Stack clear containers or labeled bins on upper shelves for easily identifiable storage. Avoid over-stuffing the hanging rod. Spacing clothes comfortably along the rod allows them to breath and prevents wrinkling. It also makes it much easier to see what you have. Separate formal clothes from informal clothes. Within each category organize clothing by type (shirts, pants, skirts, etc.). Organize each type of clothing by color. This makes it easier to find specific items. It also makes it easier to mix and match outfits. Hang all items so that they are facing the same direction. Only hang items that are ready to be worn. Items that require washing, mending or ironing should be stored elsewhere until ready to be worn. This prevents frustration when getting dressed. 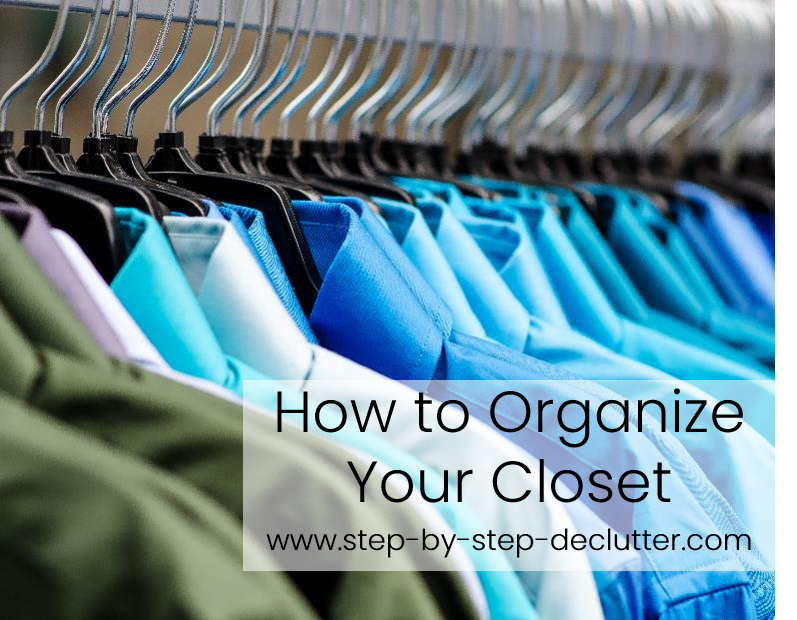 The right tool can help a lot when striving to organize your closet. It doesn't matter what kind of hanger you prefer, but it's a good idea to stick to one style of hanger if possible. The one exception is wire hangers. Wire hangers are the most likely to get bent out of shape or tangled up together in the closet. They also have a tendency to leave crease marks or indentations in your clothes. Whenever possible select the right kind of hanger for your needs. Special hangers are available for storing ties, scarves, dress pants, and skirts. If hanging space is limited, look for hangers designed to hold multiple skirts or pairs of pants. Shelf dividers keep folded clothing from toppling over on closet shelves and provide clear divisions between different types of items. Clear plastic storage containers allow you to see the contents of your box without having to pull it down from the shelf. Open bins or baskets are great for storing frequently accessed items such as socks or t-shirts. Over-the-door shoe bags are one of my favorite tools to organize your closet. They are versatile and space saving. They can be used to store rolled-up t-shirts, bathing suits, exercise gear, and so much more (see the previous section for additional suggestions). Hanging storage compartments can be used to store shoes, hats, handbags, or folded clothes. The one downside is they take up a lot of hanging space. Hanging Shoe Bags: Designed to hang from the closet rod, these typically hold up to 10 pairs of shoes and occupy about 8-12 inches of hanging space. Shoe Boxes: These are meant to be stacked on a shelf or the floor of the closet. They can be clear plastic or solid with a clear window or with a slot for a photo/label. My favorites are the drop front boxes because you don’t have to pull the box off the shelf to access the shoes. Shoe Racks: Some racks have flat shelves and some are angled. They vary in size, material, and quality, but are generally an affordable way to keep shoes organized. Shoe Cubbies: Cubbies can be placed side by side or stacked to increase the number of shoes accommodated. Shoe Trees: A shoe tree is a wire contraption with lots of 'arms' for shoes to slip on to. It holds quite a few pairs of shoes but also takes up quite a bit of space both in terms of height and width.